It gets really real on Friday when we start taking down the rig and prepping all the equipment for our move beginning Saturday. With each gym move (4) in the past 5 1/2 years we’ve had A LOT of folks come through to volunteer their energy and effort through such a taxing transition. And what we’ve come to realize is that with each ounce of change we’ve approached together, we’ve become better because of it. The thing with Stay Classy is that each person, for the time and season they are with us, near and far, are always with us, near and far. It’s an energy thing and it literally settles into the framework of who we are as a community and what we represent as a vibe to every soul that has an opportunity to connect with it. I say all this to honor all, past and present, who have contributed to our culture and brought us to this day where we can turn the page into another blank canvas together, pen in hand, with the ability and imagination to illustrate another chapter of our Stay Classy CrossFit story. I wanted to share the working timeline and schedule specific to the move for this weekend and the weekly program and hours we will be exploring together: I’ll be referring to the old gym as “National” and the new gym as “Main”. Life Lesson: Sometimes you gotta break things down to build them back up even better. Friday, Feb 8th : Pack up National and prepare equipment & inventory for moving truck load-in. Rubber flooring installation at Main begins by contractors. Saturday, Feb 9th: Lots of cleaning of the gym space and the equipment today. Begin & complete loading in and loading out equipment & inventory between National and Main. Rubber flooring installation at Main is continued and possibly completed. Build new 94” rig at Main. Begin staging equipment & inventory once rubber flooring is set and ready to take load. 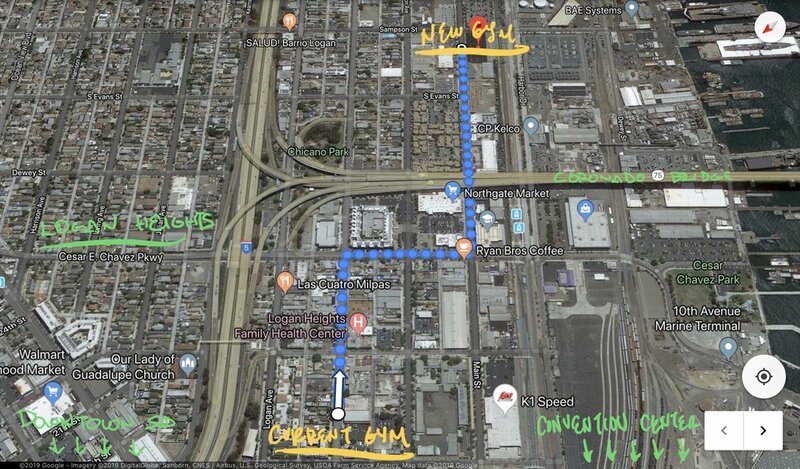 If you’re coming to help on Saturday, please come to gym on National Ave.
Sunday, Feb 10th: Complete 94” rig build at Main. Finish staging equipment and inventory to have ready for Monday’s Day 1 of full programming. If you’re coming to help on Sunday, please come to gym on Main St.
Monday, Feb 11th: CrossFit 5am, 6am, 12noon, 4pm, 5pm, 6pm, 7pm. Barrio Barbell 5:30pm. Open Gym 5am-8pm. Tuesday, Feb 12th: CrossFit 5am, 6am, 12noon, 4pm, 5pm, 6pm, 7pm. Barrio Burn 12:30pm & 5:30pm. Open Gym 5am-8pm. Wednesday, Feb 13th: CrossFit 5am, 6am, 12noon, 4pm, 5pm, 6pm, 7pm. Barrio Barbell 5:30pm. Open Gym 5am-8pm. Thursday, Feb 14th: CrossFit 5am, 6am, 12noon, 4pm, 5pm, 6pm. Barrio Burn 12:30pm & 5:30pm. Nama’stay Classy “Mega Mobility” 7:00pm. Open Gym 5am-8pm. Friday, Feb 15th: CrossFit 5am, 6am, 12noon, 4pm, 5pm, 6pm. Open Gym 5am-7pm. Sunday, Feb 17th: Nama’stay Classy 9am. Open Gym 9am-1pm. Monday - Thursday Feb 18-21st: Repeat Above Schedule. Friday, Feb 22nd: CrossFit 5am, 6am, 12noon. CrossFit OPEN Season Begins with “Friday Night Lights” 4pm-??? Workout in Heats, Potluck, & Party Vibes!!! I wanted to share a few fun things about Main and our new location. Our new Neighbors will be LIME (You know the scooter company). Yeah, them. Our space was recently a maintenance hub for many of the scooters and bikes and just a couple days ago completely cleared out the space. So I was able to snap some photos of the space and added some doodles to help us all share the vision of the new gym. Panoramic of the new gym on Main… Photo credit to Chris Sandoval. To be complete by end of March. Ground Level - East will have 2 full bathrooms. We hope you don’t mind the construction noise over the next 4 weeks, it’s all for the greater glory. In the meantime, we will have access to a dedicated Mens and Women’s restroom in the main building. To be completed by end of March. Ground Level - West will have a 15ft roll up door entrance to the gym with stadium stairs and a ramp to take you to higher ground and the main workout area. “BEFORE PHOTO” Playground - East Wall. This will be the temporary New Entrance we will use when you arrive to the gym. We will be implementing a more robust check-in system so make sure to have your Wodify account dialed in before arriving. We will now have all athletes check in for classes as well as open gym. 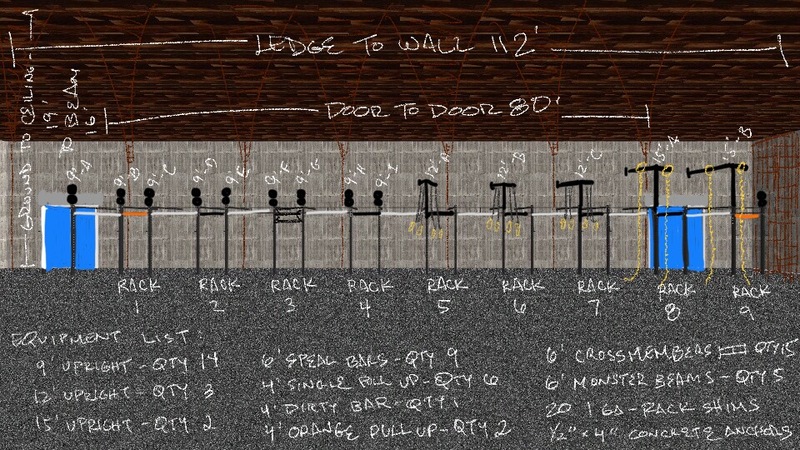 This is also the wall we will have Athlete briefings at the start of each CrossFit class. We will have this area ready to go by Monday. We’ll be installing a new roll up this weekend. “BEFORE PHOTO” 4000 sq ft of raw concrete and the industrial elements. Can’t wait till we can add a few of our toys to the mix. The blueprint for our 94’ rig build. We’re about to build the Classiest rig ever in the history of Classy rigs. We definitely have our work cut out for us this weekend and we can use all the help we can receive. On projects like these, it’s almost just as important to be there, in the presence of others, offering whatever support you can physically, emotionally, mentally, and resourcefully. The opportunity is that this is the gym we all built together, past and present, near and far. It’s definitely an exciting time, we hope to share the energy with you. Beginning Monday February 11, 2019 we begin the next adventure of Stay Classy CrossFit. We will be moving all weekend beginning Saturday and Sunday and on Monday, the start of our new location, extended hours, new programs, etc. To get us started on the right foot, here’s the address to the new gym location: 2191 Main St, Ste B, San Diego, CA 92113. We made sure we had the window seat / ocean view side of the building so you’ll be breathing in that fresh San Diego breeze everyday at Stay Classy CrossFit. You can run, walk, bike, scooter, drive, uber, lyft, etc. It’s only 5 blocks south. There is a massive allotment of non-metered, free street parking within blocks of our new gym. Because we are at a major crossing where a healthy amount of contractors and service men/women come in and out of shipyard, street parking is very competitive during the hours of 6am-3pm. All times outside that pocket is seriously so easy to park. However, we have you covered because if you have trouble finding street parking, we do as we have access to a private overflow 1 Hour parking lot with 20+ spaces only 2 blocks away that we’ll have access to 24/7. Here are the maps that outline all the free parking options available. Please note, DO NOT park in YELLOW Commercial Loading, WHITE Passenger Loading, BLUE Handicap (unless you qualify) and ZONE D (unless you have a Zone D pass) or you will get a ticket, read the signs to make sure you’re good to park. Birds Eye View of the Parking: Green is Good to Park, Red is Do Not Park, and Yellow is our 1 Hours Lot. Read the signs and mind the color of the curbs. Grey is good! Hope you all enjoy this big kahuna of a wave of newness, 2019 is going to be a wild ride!